This is the last installment in a three-part series of blogs about strategic thinking. The first blog explored how to combine two models of strategic thinking to better understand and explain how New Legends orchestrates strategic thinking with our clients. The second blog in the series delves into why strategic thinking is not a soloist act, but rather something that needs to be an ensemble activity. This third of three explores the idea of a collective strategic thinking mindset as a source of strength and source of blind spots – and zooms out to how strategic thinking connects with culture, leadership, and execution. 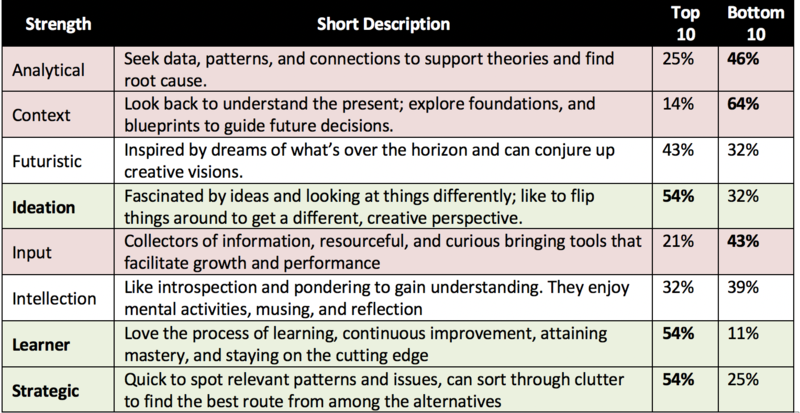 In the first blog, I reviewed how 8 of the 34 themes in the CliftonStrengths assessment map to a purpose-built model of strategic thinking called the LENS and how using these two models together can help orchestrate a full spectrum of strategic thinking activities. In the second blog, I shared how two strategic thinking strengths, Context and Futuristic, seem to be in tension with each other, at least in one of our client organizations. No one person had both strengths in their top 10 – meaning you’d need at least two people with different strengths to get both forms of strategic thinking strengths working together. The next question that begs an answer is whether there are dominant strategic thinking strengths in the organization as a collective? Is there a “hive mind” when it comes to strategic thinking? The notion of a hive mind evokes both the prospect of synergy and the risk of groupthink. Let’s look at how the CliftonStrengths can give some insight into whether there is diversity in thinking strengths or whether like-mindedness prevails. Among the 30 leaders previously mentioned, three out of the eight strengths in the Strategic Thinking domain appeared as top 10 strengths for over 80% of the people. These are Ideation, Learner, and Strategic. Five people had all three among their top 10! Almost half had two out of the three in combination (Strategic + Ideation, Strategic + Learner, or Ideation + Learner). This means there will be some specific shared ways of thinking for the people who share one, two or even three of these strengths. In contrast, a minority of people shared the Analytical, Context, and Input strengths in their Top 10 list. Context was in the bottom 10 out 34 strengths for 64% of the group. This starts to paint a picture of strategic thinking among leadership at the collective level and what it might be like to work with this group at a strategic retreat. As a consultant facilitating a large group like this, I would expect lots of energy from the majority of participants around activities that are new and creative – tapping into learner and ideation strengths. People with these three in the middle range on their ranked list would be fairly comfortable albeit someone less energized that the majority group. There would be a minority of about one-third who could be resistant to Ideation, Learner, and Strategic activities. In the “dominant” group, there could be a lot less energy for exploring data (Analytical), reviewing the past (Context), and unearthing information (Input), which could certainly produce strategic risks for the organization. So, it pays to understand not only what’s dominant for the individual, but also what is dominant for the group. It may take splitting up the group to work on different tasks based on strengths to get the most traction for an organization with this profile – as well as more conflict management when they come together as a plenary group. Being transparent about the differences and the value of each strength can help build sustaining appreciation and better use of diverse talents!